This set of chairs are constructed from of a variety of woods including ash, elm and beech. 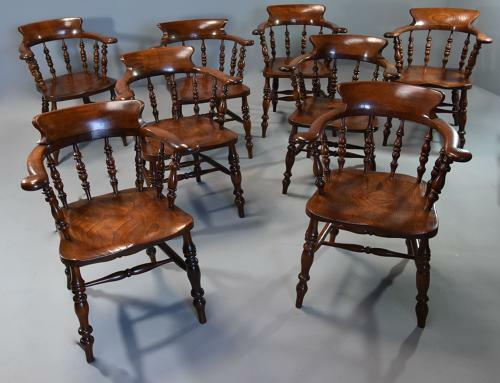 The chairs consist of a deep, shaped back support leading down to broad arms, similar to those used on a broad-armed Windsor chair leading down to eight turned spindle supports connecting the arms to the seat, two of these being arm supports. These lead down to a deep, solid shaped figured seat supported by turned legs with vase-shaped feet, the legs supported by double H-form turned stretchers.